Fans of Jake and the Never Land Pirates will know all about this ship already. This is Jake's very own pirate boat called Bucky that features in every episode of the show. This swashbuckling ship rocks and rolls when pushed along and comes jam-packed with 25 action phrases and a pirate-adventure song to boot! Skully can be perched on the lookout post and the cannon can be used for firing water at enemies! You can even launch your secret weapon, Tic Toc Croc, that explodes from a carefully hidden trap door. This is a super role-play toy inspired by the animation, and is likely to keep kids entertained for hours making up lots of pirate-fuelled adventures! Bucky comes with Jake and Skully figures and 3 projectiles. 3 x AA batteries are required. 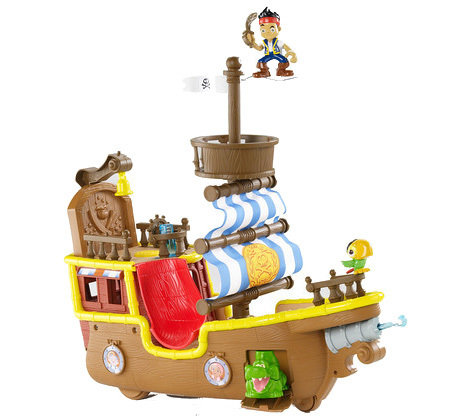 Please tell us what you think of Jake’s Pirate Ship by Jake and the Never Land Pirates.